It is absolutely necessary, for the peace and safety of mankind, that some of earth’s dark, dead corners and unplumbed depths be let alone. You awaken from a deep sleep in a strange place, without any idea of where you are or how you got there. Your body is fatigued to the point that even standing is a herculean task, and your blurred vision makes it impossible to get your bearings. In fact, you and your fellow investigators are the prisoners of some cruel mastermind, using you as his test subjects in inhumane experiments designed to test the human will. Trapped in the expansive labyrinth of a madman, you will need more help than ever before. 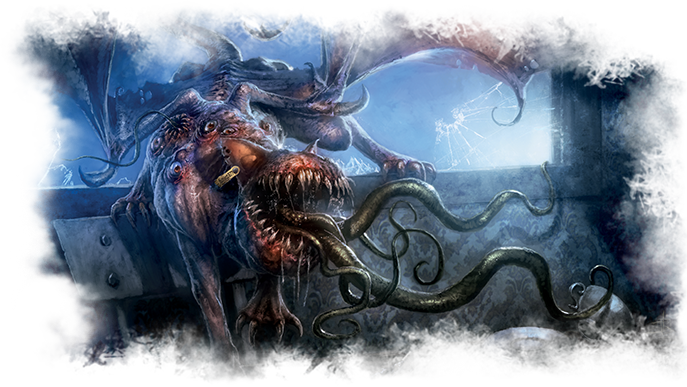 The Labyrinths of Lunacy, the epic Scenario Pack for Arkham Horror: The Card Game that premiered at Gen Con 50, is on sale at your local retailer or on our website now! Unlike many of your past adventures, this investigation is not just about solving a mystery, but about survival—and time is running out. Many act cards in this scenario pack feature Timed objectives that must be completed by the time the agenda advances. While you do not advance the act as soon as the condition is met, failure to complete these objectives will have dire consequences. In The Labyrinths of Lunacy, the act and agenda cards do not advance independently of one another. Rather, when the agenda advances it will instruct you to advance the act card as well. The only way to escape this prison is to work together, but as the clock ticks down, the strange things creeping in the dark are getting closer. Faceless Abductors (Labyrinths of Lunacy, 52) hunt you through the halls of the twisted labyrinth. If one of these monsters catches you, they drag you back to one of the madman’s many prisons, halting any progress you have made. As you evade your prison guards to explore the depths of this strange labyrinth, you will find yourself in impossible situations where game text on cards may not make sense at first. Solving these Paradoxes is the key to your survival. Keep a keen eye on the cards as they reveal themselves. It is your only hope of escape. In the depths of the labyrinths, you will be faced with impossible decisions as you find strange, disturbing Items such as the Mysterious Syringe (Labyrinths of Lunacy, 41). The letter B is emblazoned on the handle, and a mysterious liquid is held within. This presents you with an interesting possibility: you can inject the concoction into your own arm or that of another investigator (willing or not), or hold onto it. But even if you choose not to take the risk, you cannot afford to lose this asset. 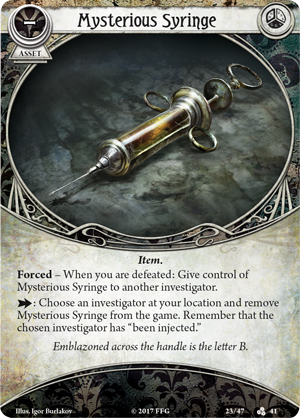 If you are defeated, you must pass the syringe to another investigator and pray that they escape, or else your death will have been in vain. 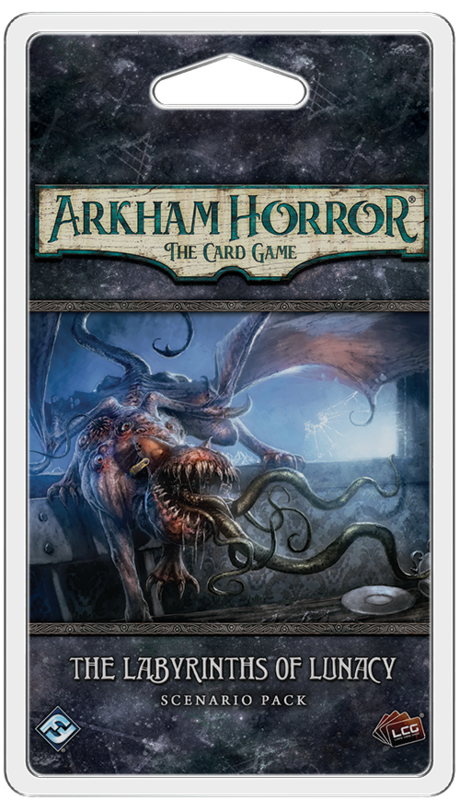 With a stunning eighty cards, this scenario pack offers you a complete standalone adventure for Arkham Horror: The Card Game. While it cannot be played as a side quest within a campaign, The Labyrinths of Lunacy provides you with an expansive game experience that plunges you into a harrowing scenario that will require all your wits and cooperation to defeat. You must rely on your fellow investigators more than ever as you encounter Traps that test your strength and will to survive. If you are not quick enough and succumb to Poisonous Gas (Labyrinths of Lunacy, 56), you will lose an action as you struggle for breath. This agility test requires a result of at least four to pass, a difficult task. 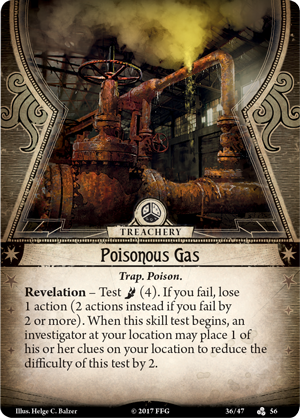 However, a fellow investigator in your location may place of their clue tokens on the location to close the valve somewhat, and reduce the difficulty of the test. Even in The Labyrinths of Lunacy, you are stronger united than apart. This Scenario Pack can accommodate up to twelve investigators divided into three teams in the Epic Multiplayer Mode. Each team of investigators faces their own set of challenges, separated by the mastermind’s design, but linked by the consequences of their actions. Every decision you make will affect your fellow investigators’ experience, regardless of whether or not they are in your party. When playing in Epic Multiplayer Mode, certain effects will allow you to give tokens, cards from your hand, or assets to investigators in other groups. A Key of Mysteries (Labyrinths of Lunacy, 40) useless to one group may be vital to another’s escape. But you had best make exchanges wisely. 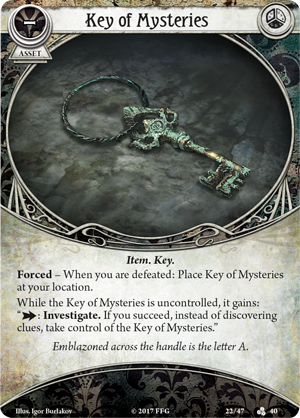 If you are defeated by the trap-ridden labyrinth or the monsters that reside there, the key is dropped where your body falls, and there it remains until another investigator finds it. One investigator’s demise could spell doom for the entire party. Even if you cannot ensnare enough investigators to run the complete Epic Multiplayer Mode, you are far from helpless. 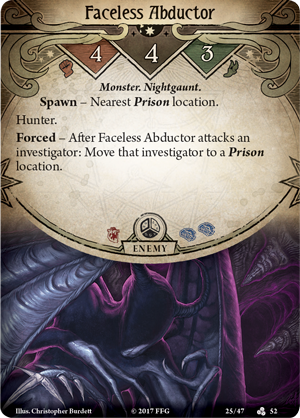 The Labyrinths of Lunacy comes with rules and a separate encounter set that allow you to play with one to four investigators in Single Group Mode. Otherwise, if you wish to experience all the madness this prison has to offer, you may choose to play this scenario as its own campaign of three mini-games, sealing yourself and your friends in different corners of the madman’s prison in each adventure. Assemble your team of investigators—only by standing united will you be able to defeat your captor once and for all and escape The Labyrinths of Lunacy! Pick up The Labyrinths of Lunacy (AHC18) at your local retailer today or on the Fantasy Flight Games website here!